Consistent light reflection of your sign day or night is ensured through the specially developed layers. The smooth and flat coating of Vuflex Premium is ideally suited to all production processes; PVC pressure-sensitive film, inkjet and screen printing. The base scrim of Vuflex Premium consists of high strength and low shrink 1100 DTEX polyester fibres running in both directions, producing a material able to withstand strong winds and impacts during use. 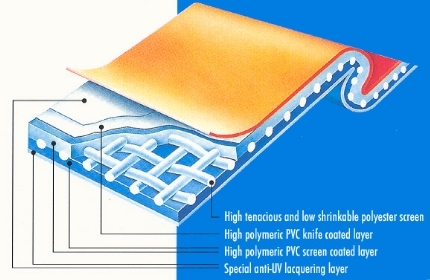 Vuflex Premium uses a high molecular PVC resin of a unique formulation for excellent dimesnional stability and temperature resistance. The strong adhesion of the spread coating system used in production ensures the application for which it is used will withstand the elements. The high tensile strength but excellent flexibility of Vuflex Premium makes tensioned applications easier to achieve. The unique anti-UV lacquer coating either side of Vuflex Premium makes for both ease of cleaning and anti-fading. An anti-wicking treatment also guards against harmful pollutants in outdoor applications and plasticizer migration is completely eliminated.